The Brazilian and Hungarian football mentality comes form the same root! The establishment of the offside rule in 1925 rewrote football at its foundations. Initially, the British reacted to this and instituted the WM system of play, which created a stiff, standardized but rational atyle of play. 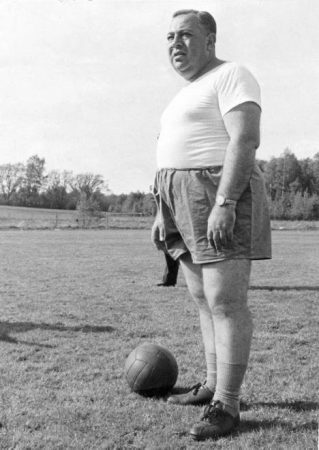 However, the main change was that instead of prioritizing attacking, it established the principle of not receiving any goals.It must be noted that in Hungary, between 1900 and 1925, the so called Central European style of play emerged, with its main characteristic being cerebral football, wherein the players had freedom of movement to enable them to carry out their ideas and solutions. The Hungarian coach, typically, continually debated style techniques to help him to evolve. One camp said that „our traditions should not be abandoned”, because the new WM system, was too inflexible and standardized for Hungarian football tastes. The other camp held that the productive (result orientated) international trends should be imitated. 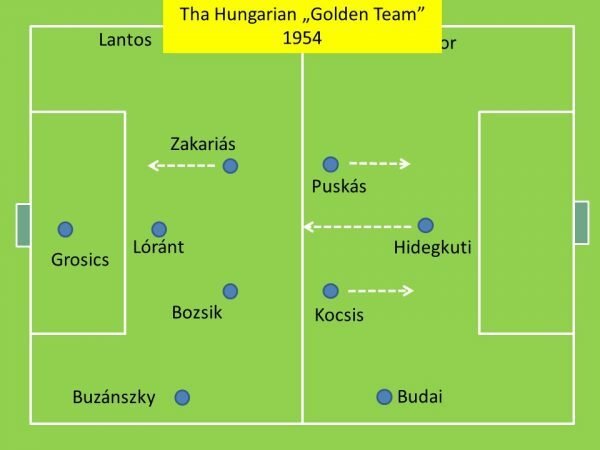 The problem of theory of play was resolved in the 1950s, when the inflexibility of the WM system was dissolved by adapting to the Hungary style.The Hungarian „Golden Team” introduced the „withdrawn (pulled back) center-forward” and the „withdrawn covering play”, with which they crushed the English national team which had been undefeated for 90 years! This system of play was essentially the 4-2-4 system, which the world recognized/attributed as being unique to the World Champion Brazilians in 1958. In the 1950s, the Hungarians were considered the Brazilians of Europe. As evidence of this, we quote from one of the Zürich Sport newspaper’s article which appeared during at the time of the 1954 World Cup. In this instance, at the World Cup, Hungary defeated Brazil 4:2. Brazil won the World Cup in 1958 in Sweden. Their head coach was Vicente Feola, who had been assistant coach to Béla Gutmann (twice BEK champion with Benfica) at São Paulo FC and it is here, that he became first familiar with the innovations of the Hungary’s Golden Team’s coaching.